Yesterday began with a stroll through Le Marais, a historic district of Paris known for its winding and cobblestoned streets. As I emerged from the metro station, my jaw dropped at the elegance of the buildings, the balconies and shuttered windows rising regally into the overcast sky. Despite the grandeur, I quickly regained my senses; I was on a mission to find falafel. Nowadays, Le Marais is cultural hub for Paris’ Jewish community, and is where some of the best falafel in the world resides. Checklist item? You betcha. I ventured to the bright red storefront of Mi-Va-Mi, where a line had stretched around the corner. Soon enough, I had a giant pita of falafel and plopped down in a secluded garden, in order to keep the disaster that is me eating falafel a secret between myself and the garden bench. It was delicious and worth the wait. As I scrubbed the tahini from my fingers, I turned the tight corners of Le Marais, finding hidden gardens, gated mansions, and chic shops carrying everything from spools of yarn to colorful watches. 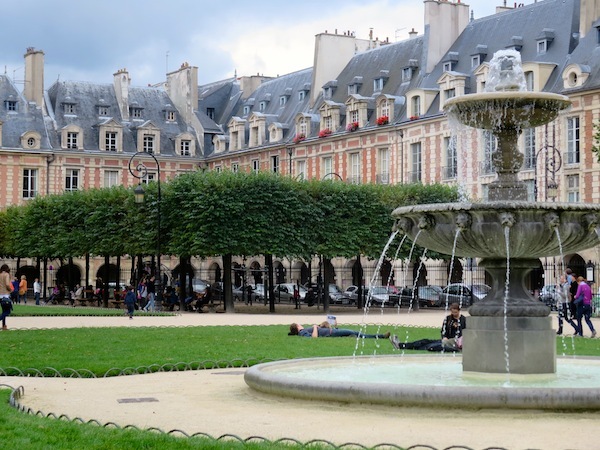 Weaving my way through the maze of Parisians and tourists alike, I twisted into one of the neighborhood’s most famous attractions; the oldest planned square in Paris, the Place des Vosges. This entirely symmetrical plaza lends itself to beautiful photos with its vivid red brick buildings and neatly trimmed leafy green trees. One corner holds a small playground, where I learned that the art of chasing pigeons is universally enjoyed. French children flew about the tree trunks, flapping their coat sleeves and kicking up clouds of sand-colored dirt, as their mothers scolded from the benches. It was difficult to tell whether the children or the pigeons more thoroughly enjoyed the game. Next came the wonder that is L’Eclair de génie. These eclairs are not pastries so much as pops of blazing colors attached to brightly enticing flavors. I carefully selected a Pistache Orange and a Caramel Beurre Salé and walked past the Bastille to the lovely Jardin des Plantes, where I located a sunny bench upon which to take the photo below. 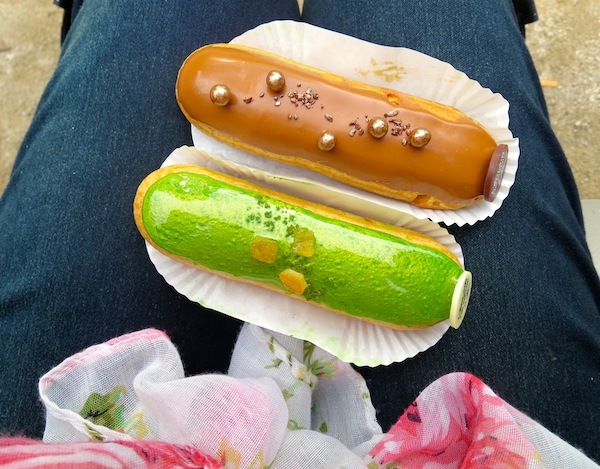 Some would say the eclairs are too pretty to eat, but not I. I managed to eat both before the day was done and could have eaten two more. My night ended with Nuit Blanche, an annual contemporary art festival held in cities around the world. Museums open to the public and modern art exhibits are set up in the streets for visitors to explore during the night. I headed to the Seine’s Left Bank, where Cai Guo-Qiang, designer of the Beijing Olympics firework display, put on a show for the thousands of people who had gathered to admire his work. This show was not only one of the most spectacular firework displays I have ever seen, but one of the best performances of any kind. 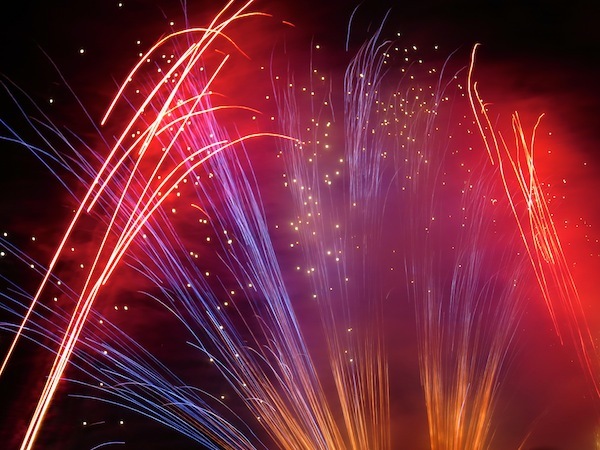 The fireworks seemed to play with each other in the night sky, circling and crossing one another, the colors mixing and crackling as a collective shiver ran down the spine of the crowd below. Let’s just say that if I marry a prince, Mr. Cai Guo-Qiang is officially invited to perform at the royal wedding. Follow Crumbs de Vie via Email! Enter your email address to follow Crumbs de Vie and receive notifications of new posts by email.